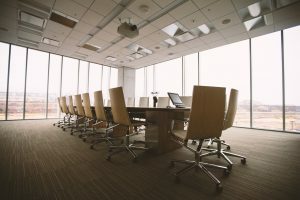 So you’re relocating your business and you find yourself faced with the challenge of designing a brand new office space. While it may seem like an overwhelming task, designing an office can be an exciting opportunity to change the look and feel of a work space, maximize the new floor plan, and update your decor. This step-by-step guide will help you to coordinate your design needs and create an office that your company can be proud of. 1. Determine your office space needs. Is your company large, small, or in between? Will you be needing conference rooms, drafting tables, multiple copy stations, or a kitchen in the break room? Think beyond the material as well. How will your company be changing as it moves to a new office space? Have you discovered that a hoteling system will cut operating costs? Or will modern design strategies your business enough money that you can improve employee comfort? Early on, you should begin talking with a space planner, upper management, and employees to discover how a new design can improve not only your work environment but the business as a whole. 2. Pick your paint. It may seem simple enough, but paint is a key part of office design. Certain paints have a glossy finish and can actually reflect light rather than absorb it. This increases the likelihood of eye strain in the workplace and will cause employees a great deal of discomfort. Softer, neutral colors tend to work best because they absorb light, but choose a shade that accentuates the assets of your office. Try an accent wall for added visual interest. 3. Choose carpet to enhance your design. In addition to noise reduction, insulation, and comfort, carpet brings an extra dash of color and style to any area. Upgrade your office carpet so that each room pops. You can use carpet tiles to separate, define, and add additional interest to your space. This checklist tells you step-by-step what to consider while designing your office. Get Your Free Office Design Checklist! 4. Let in some light. It can be as dramatic or as natural-looking as you choose, but lighting should get the job done, reduce eye strain, and highlight the best features of your space. Don’t neglect this essential design element for brightening up a dim office. For money-saving purposes, consider investing in LED lights or working with an energy-saving company. By reducing lighting expenses, you will be able to improve other aspects of your business, such as IT equipment or more exotic coffee for your staff! 5. Add window treatments. Window coverings can do a lot to enhance your office design. Are you going with blinds? Sheer drapes? Modern window treatment options have gone far beyond just vertical or horizontal blinds. Solar screens, for example, adjust the blinds to the amount of sunlight coming in, letting in the optimum amount of light for the workspace. Cellular pleated shades are another popular option. Unlike typical blinds they are partially transparent, allowing light in evenly whereas opaque blinds can be distracting. 6. Furnish your space. Select desks, chairs, and accessories with ergonomic features for comfort. Don’t forget shelves and other storage units. With all the affordable office furniture options available, there’s no excuse for ugly design. Attractive wood finishes turn even the most utilitarian cabinet into more than just a place to stuff your briefcase. You may also consider renting furniture. Sometimes this can be a less expensive option, and makes sense for a shorter lease. 7. Dress up your walls. Art, framed photography, and other wall décor can really make a difference in enlivening your office design. If you can save on energy bills or reduce office space through smarter designs, having corporate art on the walls can make an office space more welcoming for employees and clients. Creating a positive company culture can go a long way for improving your brand. Extra decor tip: your company logo on an accent wall can act as a great focal point for your space. 8. Don’t forget the smaller details. Umbrella stands, coat racks, and other essentials serve a functional purpose but can also enhance your office design. Don’t forget plants to soften corners and add a touch of green. Designing an office is a complex process with a rewarding outcome. You’ll be glad you put the thought into making your workspace more enjoyable for everyone from employees to visiting clients.